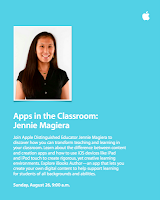 This Sunday (8/26/12) at 9am I'll be speaking at Lincoln Park's Apple Store (in Chicago, IL) to share my favorite apps for the classroom and show some examples of how to leverage them to up the ante on learning. If you're in town and would like to learn more about using iOS devices with your kids, please come by! I second Chewy's thoughts ..... Please record it. I am downstate in a 1:1 environment and am striving to improve daily. I cannot come to Chicago this weekend. I will do my best to screencast it! Either way, I'll either post a recording or a recap on this blog :). Best of luck with your 1:1 and if you come across any great new tips or tricks, please share them!